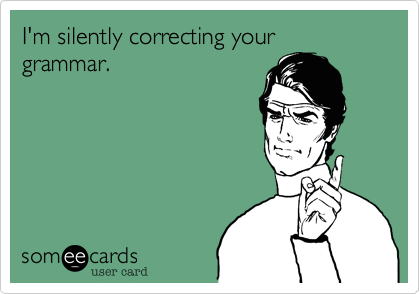 In my editing adventures, I realized something kind of hilarious and kind of embarrassing about my own writing: there were a few words that I spelled differently each time they came up. For instance, in one story, I alternated between spelling “gray” and “grey.” I didn’t even notice I was doing it, and when I did, I wasn’t sure which was the correct spelling. And so, this list was born. I looked up all the information about what was right and what was wrong and figured out why I had been confused in the first place. 1) grey/ gray: My family always had a jar of Grey Poupon mustard in the fridge when I was growing up. I think that’s where the confusion began. Grey Poupon mustard is a product of France but has been manufactured in the U.S. since the 80s. Plot twist: “Grey” was the last name of co-founder Maurice Grey (the other co-founder was Auguste Poupon). It is completely unrelated to the color. But “grey” is also the accepted British spelling of gray, while Americans spell “gray” with an a instead. According to the Grammarist, neither spelling is actually incorrect. But U.S. publications do use “gray,” while “grey” is used outside the U.S.
2) flier/ flyer- When I was an RA, I had to spell this word in many, many emails. I’m pretty sure there were a few emails where I spelled it both ways without noticing it. But now I finally know what the difference is! Kind of. American writers tend to use flyer for small handbills and flier for people and things that fly. Okay. But AP style uses “flier” for handbills.Grammar Girl talks about some of these issues in her post “‘Flier’ or ‘Flyer’?” But for the sake of consistency, I’m going to use the AP style and write “flier” when I mean handbill. I don’t think I’ve ever used that word to describe a thing that was flying. Who does that? 3) blond/ blonde- This is something I probably should have figured out earlier, too, since it’s my hair color, but I didn’t know exactly what to make of the “e” at the end. As I found out, “blonde” is the feminine adjective used in British spellings, while “blond” is masculine. While some U.S. authors use the British spellings, American publications generally use “blond” to describe both women and men. The only thing that’s definitely wrong is a) using both inconsistently and b) using “blonde” to describe a man. Good to know. 4) drier/ dryer- As the Grammarist says, “drier” is a comparative adjective that means “more dry,” while “dryer” is a noun which refers to appliances that dry things. And then there’s Dreyer’s Ice Cream, which is completely unrelated to this explanation. I think “dryers” is such an awkward-looking word. “Let’s go look at some washers and dryers.” There’s a sentence I hope I never have to say. 5) loath/ loathe- This one is hard to remember. Mostly, I think, because “loath” isn’t used as much in American English as “loathe” is. “Loath” means to be reluctant, while “loathe” means to hate. Usually, when people say “loathe,” they drag out the “o” for a longer time. As in, “I looooooooathe pickles.” But if they are saying “loath,” it’s “I am loath to eat pickles,” instead. Which would actually be kind of funny, because it seems like an overly-formal way to express your dislike for pickles. For the record, I don’t have anything against pickles. 6) crier/ cryer- Drier and dryer are both words that have similar meanings and origins. Same with flier and flyer. But here’s something interesting: “crier” means someone who announces something or someone who cries, while “cryer” refers to a female hawk (and, also, it’s an archaic spelling of “crier” which is no longer used). Another fun fact: when you Google “cryer,” the first result is the Wikipedia page of Jon Cryer. 7) story/ storey- In American English, “story” can refer to tales as well as floors on a building. For instance, “We read a story on the second story of the library,” would be fine, spelling-wise. But with the British spellings, “storey” is used instead to refer to floors on a building. The Free Dictionary lists “storey” as “Chiefly British,” a sufficiently British way to phrase that information. 8) make up/ makeup/ make-up- When people come together after a disagreement, they “make up.” The distinction between the other two words– “make-up” and “makeup”– is more subtle. “Make-up” is used to talk about cosmetics outside the U.S., while “makeup” is used in American English. Interestingly, Make-Up Artist Magazine, which was founded by an American, still uses a hyphen. …“Laid” is also the past participle form of “lay.” So, when helping verbs are involved, “lay” becomes “laid” and “lie” becomes “lain.” Grandma had laid the chicken in the oven earlier this morning. The chicken had lain there all day until it was cooked all the way through and ready for us to eat. Personally, I try to avoid using “laid” as the past tense of “lay” when I can, because of its alternate slangy meaning. And I avoid using “lain,” too, because I feel like it sounds too formal. But sometimes you gotta do what you gotta do. 11) every day/ everyday- I have spelled this incorrectly many, many times. “Every day” means daily, while “everyday” means commonplace or normal. So “I’m trying to blog every day about my everyday adventures in reading and writing” would be a great sentence! American English is like an enigma wrapped inside a mystery sometimes– inconsistencies abound, and sometimes, there isn’t a clear answer about what the “right” thing to do is. I hope you learn vicariously through my mistakes. But if you’re having a hard time remembering the differences, just look it up. I’ve found that it’s SO much easier to do a little bit of research beforehand than guessing and trying to go back later to correct all your mistakes. This is excellent – and very true. I pause over using “all right” and “alright”. Cheers! I enjoyed this article. Sure thing! 🙂 Thanks for reading! Great post! It’s nice to see a list meant for more knowledgeable grammarians, but ‘ll admit that “yer” and “ier” frequently stump me! Thanks for the reminder! The one that drives me crazy, and I see it a lot at work: setup vs. set up. So far as I know, the former is a noun and the latter is a verb, but people use them interchangeably in emails. There are a number of similar cases, e.g. login vs. log in. I don’t know what the official rule is about these.